German-India delegate meeting on 4 Feb 2019. India is looking for greater collaboration with Germany in projects like smart cities, food processing sector, building of airports, dairy sector and technology for green energy. 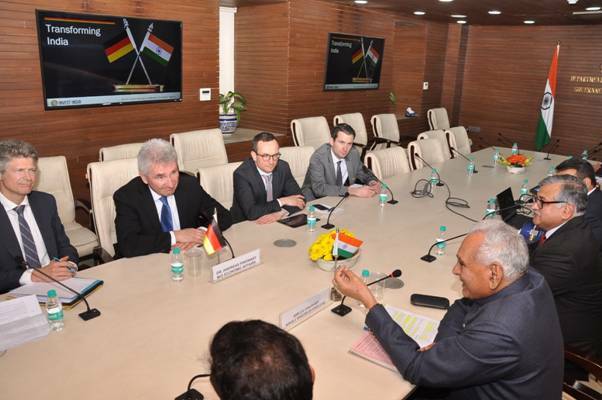 This was discussed with a high-level German delegation led by Dr. Andreas Pinkwart, German Minister of Economic Affairs, Digitalisation and Energy of North Rhine Westphalia during a meeting with Minister of State of Commerce & Industry, C R Chaudhary, in New Delhi on4 Feb 2019. The German side wished to gain more insight into the economic and industrial development in India and also learn more about German investments in India and their facilitation through the Indo-German Fast Track mechanism. Further, Germany desired to look at opportunities and challenges for German companies in India and to get a better understanding of the start-up India programme and its current status. C. R. Chaudhary assured of opportunities for German investment in the 100 smart cities and construction of airports.